Early puppy development is the critical learning phase to set you and your puppy up for success. We recommend starting as soon as they have two rounds of vaccines. See what the American Veterinary Medical Association has to say about early socialization here. The best place to set your new puppy up for success! This foundational puppy course covers basic obedience commands such as SIT, DOWN, COME, LEASH WALKING, RECALL, GOOD HANDLING SKILLS, DROP IT and more, and provides good socialization with other puppies. You and your puppy will also learn how to navigate through other behavioral issues like housebreaking, jumping and chewing. Your teenage puppy is growing quickly and you want to work on those important age appropriate manners! 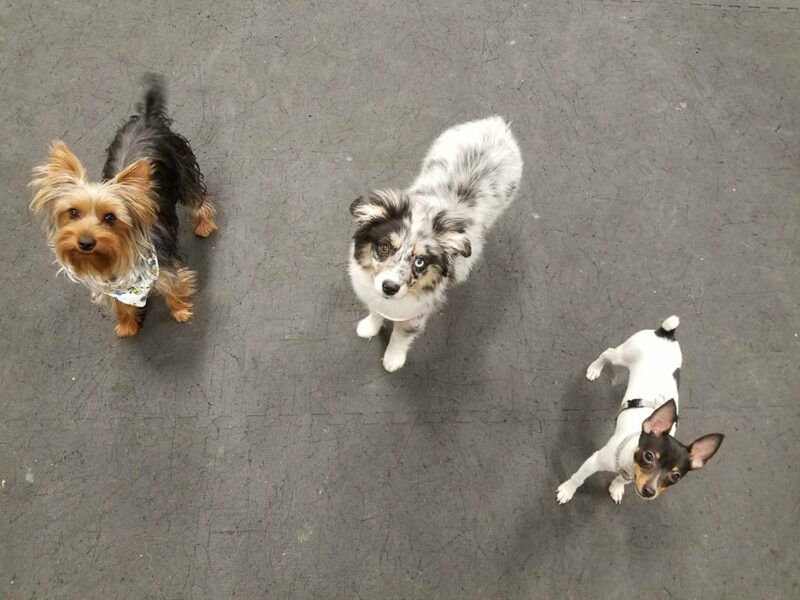 In this class, puppies and their owners will focus on skills such as LEAVE-IT, WAIT AT THE DOOR, SIT, DOWN, LOOSE LEASH WALKING, STAY, POLITE GREETING and MORE while slowly introducing more distractions. This class will also help students navigate through the challenges of living with an adolescent puppy behavior changes. The class is designed for 6 to 11 month old puppies who have completed our Puppy class or are just getting started in training. Are you looking forward to getting your puppy into the sport of Agility, but they are too young to really get started? Or maybe you are looking for a way to burn off extra energy while having fun with your puppy? This fun class is designed to get your puppy moving, learning some foundational agility skills appropriate for your puppies age and continue their socialization. The puppies will be working on various pieces of equipment kept at low impact levels to prevent injury. Scent Work is for any dog who has a nose! This activity will satisfy your dog’s mental stimulation and olfactory needs (the need to SNIFF)! It is also very beneficial for dogs lacking in confidence or dogs who need a job. Scent Work Foundation is for all dogs of any age and any breed. This introductory course teaches your dog the foundation of the game, gets them focused and builds your dog’s intensity to hunt. Depending on the dogs level of experience we will work all four elements of Scent Work (boxes, interior searches, exterior searches and vehicles) on their primary reward (food or toy). The human students will also learn to hone their own observation skills and enjoy watching their dogs have fun! Age range: all ages Pre-requisite: none, no training required.